The power of the mind – For the fainthearted . . . The RTÉ website carries news of a man who lost 4 stone in 12 weeks, by buying blue crockery. Apparently, because the blue is not the colour of any popular foodstuff, it has the effect of suppressing the appetite. Certainly, the man has mastered his weight problems, but one suspects that the power of his own mind was more significant than any crockery he might have bought. The blue crockery seems a throwback to an ancient Irish tradition of objects being efficacious in restoring one’s health. My first encounter with a holy well was on a late December afternoon at Old Leighlin in Co Carlow. Beside the holy well, there was a heavy iron box fixed to the ground. Perhaps it had once been for offerings people might make; it was covered with an odd assortment of items – memorial cards, funeral notices, prayer cards, a picture of Padre Pio, hand written requests, a child’s doll, the plastic cover from a Ventolin inhaler. It was like some religious version of Kim’s Game. Everything was soggy and the print had run on some of the cards. To a hard-nosed English rationalist, there had seemed a deep sadness about the eccentric collection; those leaving items could not have failed to notice the esoteric quality of the thing, was this some last throw of the dice? Was it a case of everything else had failed, so what was there to lose in going to the well and leaving a symbol of one’s hopes? 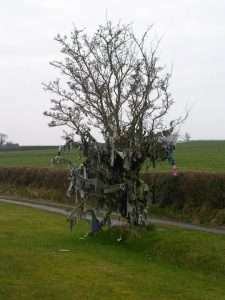 A tree stood nearby, skeletal, gaunt in deep midwinter, its branches were tied with strips of cloth of varying ages and colours. 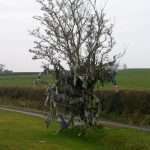 Why would anyone want to tie coloured rags to a tree? What deity was there that responded to such gestures? The conditions may have been the sort that would have disappeared themselves, others may have had a strong psychosomatic dimension so that the place of the object or the cure was that of a placebo which prompted a belief in healing; but whether its blue crockery, ribbons on a tree, or splashes of water, isn’t it the result that matters? The blue plate thing was to give the eye of the eater the impression that there was more food on the plate that there was, no food is blue. But the real reason it worked was the plate was 1/3 less than a normal dinner plate. That and not eating two dinners. 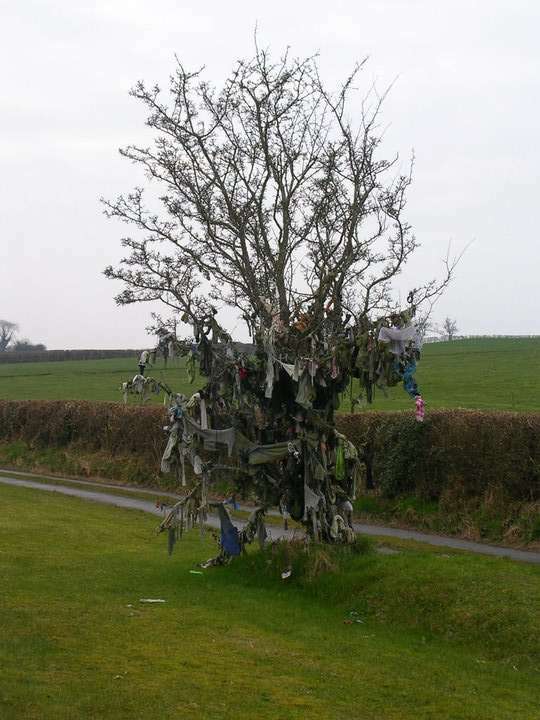 The Holy Wells and Rag Trees are far older. Most of the Celtic La Tene metelwork came from them. But they were also used as a tool to continue a Christian community. While you mightn’t be in communion in a structure you could by drinking from a source. The tree is a bit different for usually it’s a Whitethorn. This tree isn’t in the pollen history until the advent of the Roman occupation. Used I contend to manage the great wool ranches, and then replicated when the Normans took over and them and their church re-empired the land to repeat the great wool estates this time under the church. And this came over with the Normans to Ireland. I say usually a Whitethorn. But of course before the Romans the tree would’ve been a Yew.